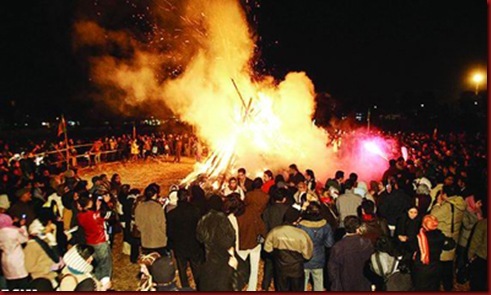 Iran’s Zoroastrian community held the Jashn-e-Sadeh Festival for celebrating the discovery of fire on the 10th of the Iranian month of Bahman (which coincided this year with Jan. 29). Considered one of the biggest Persian festivities in ancient times, Jashn-e-Sadeh — also known as the day of kindness — is celebrated by Zoroastrians throughout the world. 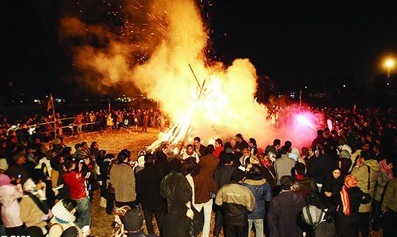 Sadeh is a mid-winter festival celebrated 50 days before Norouz (the Persian New Year starting on March 21) to honor fire and to defeat darkness and cold. The name Sadeh, meaning hundred in Persian, refers to the total of 100 days and nights left to the beginning of the New Year. The festival dates back to the time of Houshang, the first Kianid king who discovered how to light a fire. Zoroastrians believe that Jashn-e-Sadeh recalls the significance of fire, energy and light–the light that comes from God and warms the hearts of all creatures. On this day, Zoroastrians lit a huge bonfire in every town and city, gather around it and perform religious rituals and thank God for His blessings. The Zoroastrian priest recites the Gathas (religious hymns) and prays for the country+s prosperity. 2. The flames of fire always tend upwards, symbolizing the human yearning for the Higher Life. Thus, according to Eternal Law, by which all progress upward is guided, fire is the natural step toward such a Higher Life. Zoroastrians keep fire burning in their fire temples as a symbol of purity. They pray in front of the fire and believe it cannot be defiled as long as it is burning. It should be noted that Zoroastrians do not worship fire. It is only a symbol of purity and a remembrance of one of God+s best blessings for humanity. Prophet Zarathustra chose fire as his symbol for it is believed by some to be the purest of God+s creations. When he talks about fire in the Gathas, he speaks of the fire of life in the human body, which gets extinguished only when one dies. It is this fire that we are expected to keep pure. Avesta, the holy book of Zoroastrians, discusses different types of fire such as the fire of nobility, happiness and good life. Human beings should keep the fire of conscience and the fire of mind pure and feed them with Good Thoughts, Good Words and Good Deeds. Zoroastrians in Tehran celebrated Jashn-e Sadeh at the city+s Markar Hall, while similar ceremonies were also held in other Iranian cities, including Isfahan, Yazd, Shiraz and Kerman. They do not face any restrictions in conducting their religious rituals in the Muslim majority Iran. Wearing the traditional white dress, Zoroastrians lit a fire and offer prayers, seeking the welfare of oneself, one+s family and society. They distribute sweets and eat fruits and nuts on this day. Zoroastrians also give something in charity to the needy on this day, in gratitude for God+s blessings.